Registration begins tomorrow (May 1) for the City of Cerritos youth soccer league at the Cerritos Sports Complex from 4 p.m. to 8 p.m. if you are a resident. For non-residents, registration will open on May 8. If this is your first time signing up, bring something to read and be prepared to wait! Based on my own experience, the wait time is about an hour or more. The process has improved slightly because the staff will now hand you a number and you wait for your number to be called instead of standing in a “Disneyland” line. The fee is $45 and you get a jersey and a trophy at the end of the season. The kids are divided by birth year so kids born in 2008 will be entering Rookie I and so forth. The Cerritos Sports Complex is located at 19900 Bloomfield Ave., Cerritos. If that’s not enough soccer for you, check out the AYSO (American Youth Soccer Organization) program. Cerritos falls under Region 54. Upcoming sign-ups are May 16 at Cerritos Park East. Please check their website for more information. South Bay Youth Basketball and CSU Dominguez Hills will conduct their annual Basketball Fundamentals Camp on May 18, 2013. This one day camp is open to all kids ages 5-8. My son has attended this camp in the past and it’s really great. The Men’s head basketball coaches conduct this clinic and your child will even receive a T-shirt and basketball all for the low price of $30! Sign up soon though because space fills up fast. 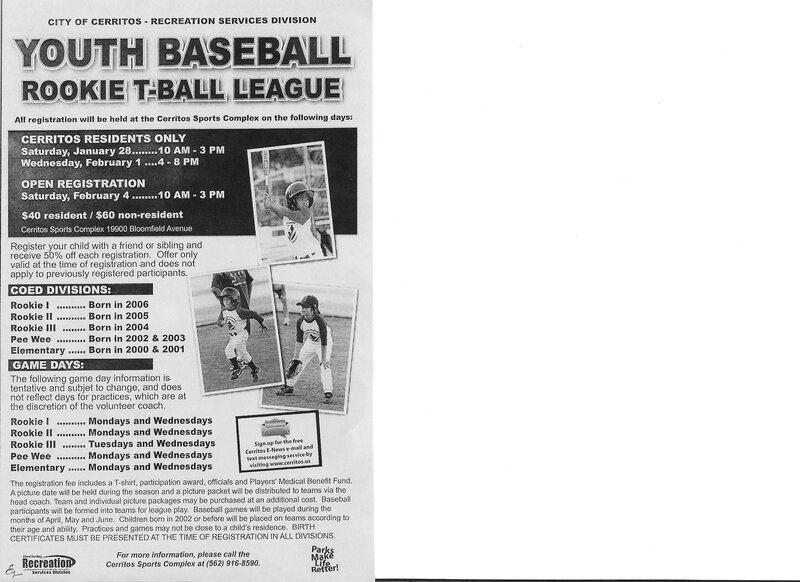 Baseball league registration for the City of Cerritos begins today for residents. The league is sponsored by the City of Cerritos Recreation program. If you sign up with a friend, the city is offering a 50% discount for each player. Registration opens to everyone on February 2. To register, go to the Cerritos Sports Complex at 19900 Bloomfield Avenue (562) 916-8590. Registration begins on Saturday, November 3 for the City of Cerritos youth basketball league at the Cerritos Sports Complex from 10 am to 4 pm if you are a resident and again on November 7 from 4 pm to 8 pm. For non-residents, registration begins on November 10. If this is your first time signing up, bring a hat and a chair and be prepared to stand in a long a** line! Based on my own experience, the wait time is about an hour or more. The fee is $45 and you get a jersey and a trophy at the end of the season. The kids are divided by birth year so kids born in 2007 will be entering Rookie I and so forth. The Cerritos Sports Complex is located at 19900 Bloomfield Ave., Cerritos. See you in line! Today is also the first day to register for programs and story times at Cerritos Library. Also just a reminder that this Saturday is FREE day at the La Habra Children’s museum and the new exhibit is Dinosaurs. It’s also FREE (Sun)day at the Bowers museum in Santa Ana. There is also a free Kids workshop at Home Depot. On Saturday, your child can build a Turkey Napkin holder. Registration begins tomorrow (May 2) for the City of Cerritos youth soccer league at the Cerritos Sports Complex from 4 p.m. to 8 p.m. if you are a resident. For non-residents, registration will open on May 9. If this is your first time signing up, bring a hat and a chair and be prepared to stand in a long a** line! Based on my own experience, the wait time is about an hour or more. The fee is $40 and you get a jersey and a trophy at the end of the season. The kids are divided by birth year so kids born in 2007 will be entering Rookie I and so forth. The Cerritos Sports Complex is located at 19900 Bloomfield Ave., Cerritos. If that’s not enough soccer for you, there is also the Cerritos Youth Program’s Summer Academy. They play on Fridays beginning June 15th also at the Sports Complex. If you’re not completely burned out by then, and your kid still wants to play, check out AYSO (American Youth Soccer Organization) program. Cerritos falls under Region 54. Upcoming sign-ups are May 3 and May 7. Please check their website for more information. Last week my toddler and I went on a field trip to PDA USA. PDA USA stands for the Pacific Diving Academy located in Santa Fe Springs. If you are familiar with this area, it’s located in an industrial area on Shoemaker and Excelsior. When we were given the opportunity to go on this field trip last year, I was hesitant to take my little one because I thought she would be too young. She was only 1.5 then but surprisingly, she LOVED it! The PDA is a gym that offers classes and training for tumbling, gymnastics, and diving. Often times, when you enroll in tumbling classes through the City of Cerritos, it is through PDA. There are trampolines, balance beams, a big foam “pool”, and an assortment of tumbling apparatus. They have classes for children as young as one. If you are unsure whether this activity is right for your child, they have open play on M/W/F from 10 a.m.-11a.m. Once a month they also have “Parent’s Night Out”, where your child can play there from 6:30 p.m. to 10:30 p.m. The price is $15 per child and includes pizza and a drink. Lastly, they also have summer camps if you’re looking for activities to keep your kids busy this summer. SJS what? Yes, that stands for the Southeast Japanese School and Community Center. This community center has been around since 1925. They are a non-profit organization with a variety of activities that are open to anyone regardless of race or religion. Even though they’ve been around for almost a decade, we just learned of this organization last year when my son participated in their Rascals program. Rascals is a basketball program that teaches young kids the fundamentals of basketball. Kids are divided into groups by gender and age. They have just started accepting applications for the Summer session, which begins on June 3rd. If you are interested, applications are due by May 15th. You can download the application from their website. Space is limited and this program is very popular so turn in your applications soon! Don’t be lame like me–I missed the deadline last fall so my son didn’t get to play. oops. SJSCC also offers a variety of other programs. I have not personally experienced any of them with the exception of Rascals but my friends have and say they are a blast.